This is a story of US Navy SEAL, Mike Tarik, who is an American citizen, but 1/2 Saudi and 1/2 American, through his mother. His father is a world renown cardiac surgeon. Dr. Bedir Tarik met his wife, Annie, over in Saudi Arabia where she was an American school teacher. Bedir, who is Sufi, believes firmly that love is the only way to peace and harmony in the world. He falls in love with Annie, and they marry in Riyadh. Later, she gets pregnant with Mike and he is born in San Diego, California. Bedir takes his young son over to Saudi Arabia for three weeks every year. He has a charity in Riyadh, and he and Mike take a pickup and distribute clothes, food and money to the poor at the fringes of that city, as well as to many others. He teaches his son generosity, giving back and being grateful for what he has. Mike grows up wanting to become a Navy SEAL. Bedir has already shown him his family’s lineage and tells his warrior son that he has the genes of his warrior great-grandfather. Mike’s view on it is that he wants to help the poor and oppressed, to rid them of tyrants who kill or make their lives miserable. When he deploys to Afghanistan with Seal Team 3, he works with NGO charities to bring food, clothing, and shoes to the desperately poor Afghan villages near where his team is located. He carries on his father’s belief in always helping those who have less. But on one mission, he finds himself in need. He and his four-man SEAL team are out on a mission. And it is a black ops US Marine Corps sniper who saves his team and him from a deadly ambush. And she’s a woman! Mike’s entire life changes in the moment he is injured and saved by this mysterious operator who cares for him deep in the cave systems of the Hindu Kush Mountains near the Pakistan border. 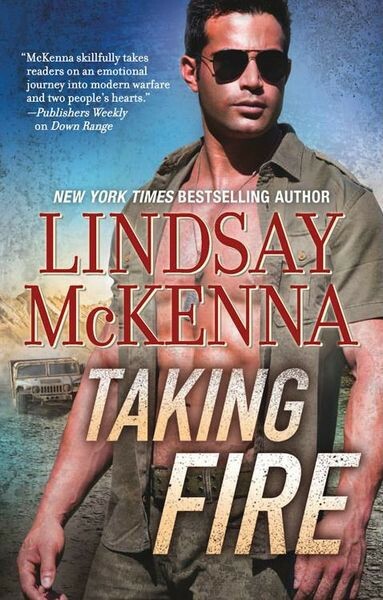 Sergeant Khatera Shinwari is wary of this SEAL, must maintain her deep black ops cover and although she’s powerfully drawn to Mike, there is no way she can act upon it. Mike, before he’s picked up by a Night Stalker helicopter once he’s ready to leave her care for FOB Bravo, promises her, he will see her again. Khat doesn’t believe him, as much as she wished she could. Her life is not her own. Her loyalty is to her Afghan people, not to a single man like Mike. But life has a funny way of changing up, and Mike isn’t about to just let this enigmatic, beautiful woman disappear out of his life. No way….. I had great fun creating this story and it’s unlike anything my readers have read. I’m very excited about it, about the sympathetic characters that you are sure to cheer on! And toward that end? I’ve created a “Director’s Cut” of a much longer ending to TAKING FIRE. Don’t worry, the book you’ve bought is complete with an HEA ending. But if you want to know “what else” happened? Then ON FIRE, HQN, 5.1.2015, digital only, 40,000 words long and $2.99, will be available to you to continue their twisting and dangerous destiny with one another! This is a Shadow Warriors series pocket book and ebook.